Run on the Seamen’s Savings’ Bank during the Panic of 1857. 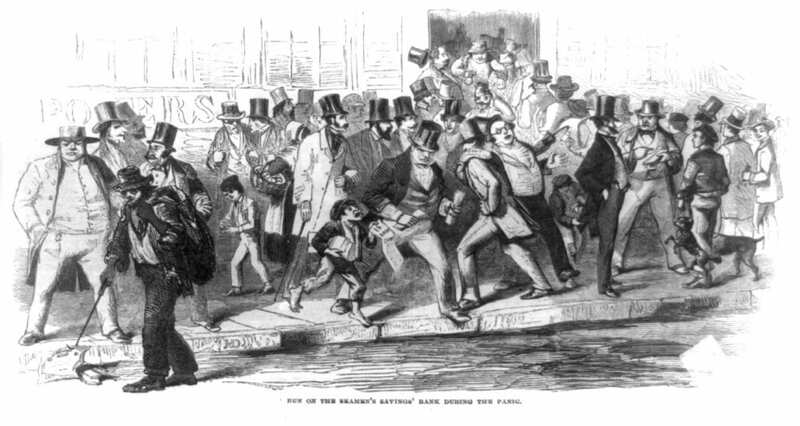 On Oct. 13, 1857, after the Ohio Life and Trust Co. declared bankruptcy, panic struck the New York Stock Exchange and hundreds of other banks and individual investors were ruined. This wood engraving shows a crowd gesturing and shoving. A ragpicker picks up now-worthless stock certificates, and a pickpocket operates unnoticed. Source: Wikipedia.org (public domain). In the 1850s, immigration to the territory influenced the price of everything. Between 1855 and 1857 Minnesota welcomed a yearly average of thirty-five thousand immigrants. The demand for land was so great that speculators bought plots at a low cost and resold them at inflated prices a short time later. This “sure thing” made them very wealthy. On Aug. 24, 1857, the Ohio Life Insurance and Trust Company failed, beginning a nation-wide financial crisis. Nowhere did the Panic of 1857 strike with greater severity than in Minnesota. St. Paul was hit especially hard. Marshall and Company, one of the city’s banking mainstays, was forced to close in early October. Borup and Oakes, another St. Paul bank, suspended its operations on Oct. 21. Months before the panic, on March 3, 1857, four rail companies were given a land grant to start building railroads in Minnesota. Politicians hoped these railroads would save the state. In April 1858 the state loaned them $5 million. By July 1, 1859, however, the rail companies were bankrupt. Construction stopped and Minnesota’s economy collapsed further. The persistent productivity of Minnesota’s farms offered the state a path to recovery. Large wheat crops in 1859 and 1860 attracted the notice of immigrant farmers and helped the state achieve its first marked population increase since 1856. The Panic of 1857 exposed weaknesses in Minnesota’s economy and forced reforms. Banking laws instituted in 1858 made the state auditor the supervisor of banking in Minnesota. They regulated and safeguarded the money circulating in the state. The rampant speculation that had helped cause the crisis ended. Prices of commodities, including housing, land, and food, returned to normal. Eventually Minnesota recovered. Economic development during the Civil War boosted industrial production and spurred the growth of new businesses. In Jan. 1864 the St. Paul Press reported that financial confidence had returned to the region. Merchants were out of debt, buying and paying with cash. The state that at one time had no currency in circulation once again had it in abundance. Reicher, Matt, “Financial Panic of 1857,” MNopedia, Minnesota Historical Society. www.mnopedia.org/event/financialpanic 1857 (accessed April 5, 2019). On Aug. 24, 1857, the Ohio Life Insurance and Trust Company fails, triggering a financial panic that spreads across the country. 1855 Minnesota Territory enters a boom period that lasts for the next two years. 1856 Minnesota Territory welcomes about 35,000 immigrants. 1857 More than 300 new town sites have been inaugurated in the territory since 1855. 1857 Over five million acres of public land have been sold in Minnesota since 1855. 1857 Financial panic hits the country on Aug. 24, after the failure of the Ohio Life Insurance and Trust Company. Oct. 3, 1857 Marshall and Company, a St. Paul bank, closes. Early Oct. 1857 St. Paul banks halt hard-currency (specie) payments to account holders. Oct. 21, 1857 Borup and Oakes of St. Paul suspends its banking operations. Nov. 3, 1857 Ramsey County begins issuing scrip as a replacement for the hard currency disappearing from circulation. Counties across the territory follow suit. May 11, 1858 Minnesota becomes the 32nd state in the Union. That same year, immigration slows considerably, raising concerns about depopulation. July 26, 1858 The Minnesota Legislature passes the General Banking Law, beginning the path toward regulating banking and usury laws. $5,000,000 in an April 1858 loan to help spur development are now bankrupt. Minnesota’s credit structure collapses. 1860 The second impressive wheat crop in two years attracts new immigrants to Minnesota. 1861 The start of the Civil War spurs economic growth that helps Minnesota complete its recovery. 1864 In January, the St. Paul Press reports on the return of consumer confidence to the local economy.